Svea Ekonomi Group is an independent financial group primarily offering different kinds business finance services. Today Svea Ekonomi operates in several different countries in northern Europe with a leading position within their area of expertise. 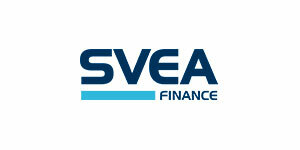 Privately owned Svea group was formed late 1981 and started out as a minor Swedish finance company offering factoring and invoice purchasing combined with debt-collection services. Lots of things has changed since the start, today Svea is much more of an international company operating not only in neighboring Nordic countries: Denmark, Finland and Norway but also in Austria,Estonia,Germany,Latvia,Netherlands and Switzerland. In recent times Svea Ekonomi has expanded their business into new markets and are now offering both business and personal consumer loans. They are also continuously trying to reach into new markets through investments and company purchases. In April 2018 Svea Ekonomi invested capital in Zlantar a personal finance app and the month after Svea acquire 90% of the shares in the Finnish payment institution Maksuturva Group AB and Maksuturva ICT Services AB. Looking into the future Svea Ekonomi has a set goal of surpassing their competitors by combining new technology and innovative solutions. Are not offering any business loans as of yet offering, but they do provide factoring services.